Reviews of big, thick, weighty books should be given twice as much space as those of thinner texts; however, I suppose the length of a review is governed by the reader's patience and not the "stuffedness" of a book with characters doing stuff. Much as I would like to write about this incredible new world, with its host of new characters and new sort of creepiness for hours, I could review D.M. Cornish's Lamplighter, the second in the Monster Blood Tattoo series in a single, longish word: get-supplies-in-before-you-start-because-you-will-NOT- put-it-down-and-will-not-even-sleep-until-it-is-done-then-you-will-wait-breathlessly-(and-a-little-grumpily)-for-the-third-installment. 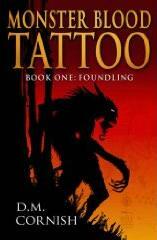 D. M. Cornish previously demonstrated his talent for creating characters that readers befriend in his first book in the Monster Blood Tattoo series, Foundling. Lamplighter carries on with Rossamund, the foundling off on an adventure in the last book, finding his new home with the Lamplighters, the guild who keep the lamps lit on the Wormway, both symbolically and literally, keeping the darkness at bay and civilization basking in light. In this second book, Lamplighter, the sophistication of Cornish's Half Continent is revealed in the complexity of human/monster relations, Rossamund's relationship with Europe and his new friend Threnody, and the intrigues within the Lamplighter camp. Finally, Rossamund completes his prenticeship and takes his place among the lamplighters along the Wormway. Cornish explores life's injustices through Rossamund's interactions with various well-drawn characters who are cruelly treated at the hands of others, who rise above their station due to their own machinations and who are suddenly gone from the world in accidents and attacks. In the course of the novel, Rossamund confronts and deals with his own sedornic (monster-loving) ideas and the implications these have on his relationship with Europe, infamous monster-hunter and his budding with his new friend and fellow outcast, Threnody, a rebellious young peer with talent as a wit, who becomes one of the rare female Lamplighters. This book is interesting on various levels. It is certainly a good, solid novel with highly entertaining characters. It is also an exploration of self -- how do we become the people we end up as? What role do our parents, important adults and our society play in this becoming? What does it mean to be human? Lamplighter takes on the paradoxes of life: can people who are kind to us also be evil? When is killing the right thing? Where do Truth and Justice and Good live in lives otherwise characterized by Hobbes (and so many others) as nasty, brutish and short? Why is nothing simple? And finally, what happens when the humans are monstrous, and the monsters, humane? In short, and because I think it is always better to read original works rather than reviews, I urge you to pick up this book (after you bring in supplies) for it is, superficially, an enjoyable escape, while simultaneously a satisfying cultural critique that I keep returning to chew. And wait irritably for Book Three.